We have collected and analysed 50 expert reviews and 11661 user reviews from international sources. Experts rate this product 84/100 and users rate it 90/100. The average review date is 01-05-2017. 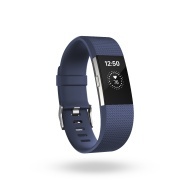 We have compared these reviews to 213025 reviews from other Smart Watches & Activity Trackers. The alaScore™ for this product is 94/100 = Excellent. Last update: 24-04-2019. With bonus features like device charging and speakerphone, the relatively compact JBL Charge 2 impresses as one of the best Bluetooth speakers we've come across. Fitbit Charge 2 Review: We test Fitbit's new fitness tracker, the Fitbit Charge 2, which updates the original Charge with a bigger screen and new features. Swappable bands. A multi-line OLED display that can show time and fitness data. Always-on heart rate. A great companion app. Affordable price. Five-day battery life. Not water-resistant for swims or showers. Lacks GPS. Phone notifications on the Charge 2 display are limited and hard to read. If you don't need water resistance and GPS, the Fitbit Charge 2 is the best overall fitness tracker you can buy.